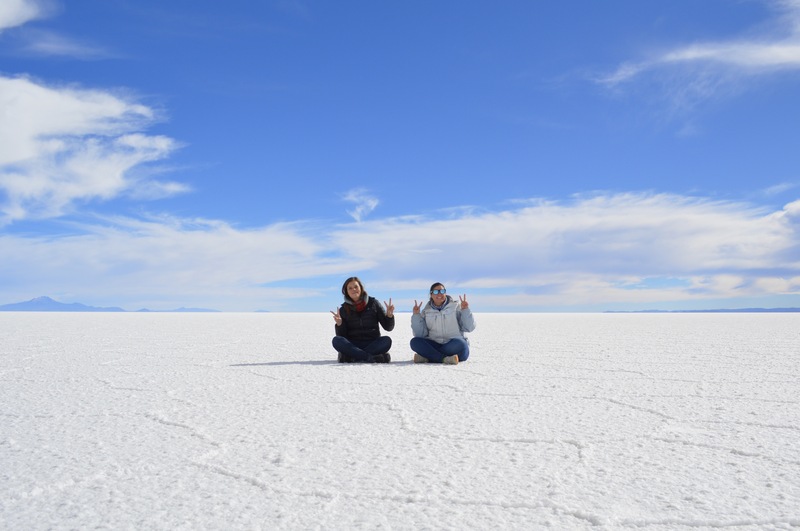 While traveling around South America we had met a lot of people who had done the three day/two night Salar de Uyuni tour. They all said they loved the scenery and experience but when we asked what company they used for their tour, they all replied saying that they wouldn’t recommend the company that they had used. After this, I started to do some reading. Online reviews were horrifying saying that the drivers drove too fast, bags fell off the 4×4, people got altitude sickness, food was shocking and it was freezing cold at the accommodations. What were Courts and I getting ourselves into? Our hostel manager, Leornad recommended a company called White and Green. 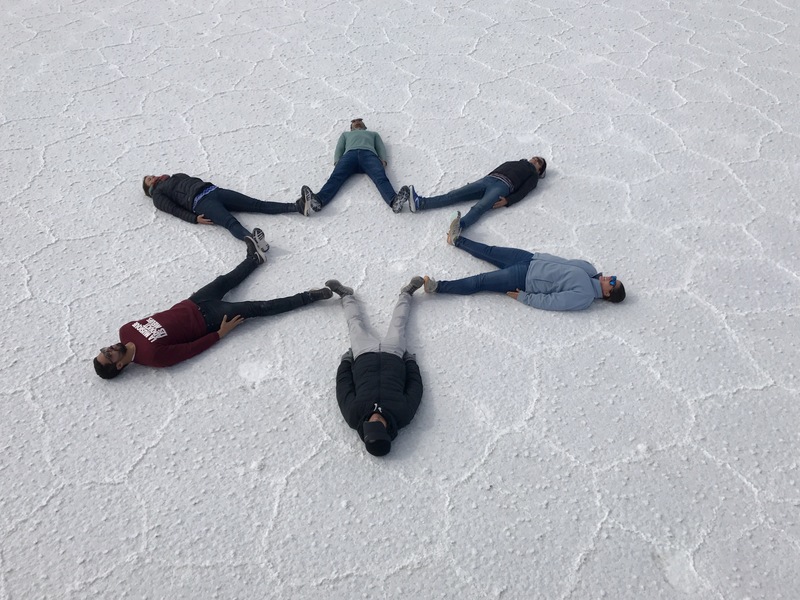 All of his other recommendations for San Pedro de Atacama had been spot on, so after looking at reviews for this company online we decided to book with them. We were fetched from our hostel at 7 am along with 4 other people. We then collected another 6 people from various hostels around San Pedro de Atacama and headed to the Chilien side of the border to get our exit stamps. After getting our passports stamped the tour company provided a lovely breakfast that included bread, avocado, ham, cheese, yogurt, cereal, coffee, and most importantly coca tea. Coca is the plant that cocaine is made out of, but don’t worry we weren’t doing lines. Instead the leaves of this plant are a local remedy to help with altitude sickness. After this, we drove to Hito Cajon, which was the border post in which we crossed over into Bolivia. This part of the Chilean/Bolivian border sat at an altitude of 4,600 m and was -8 C. At this stage, the 12 of us were separated into two 4×4’s. One was for the English tour and the other for the Spanish tour. Courts and I had signed up for the Spanish tour because we had been told that the guides don’t give you much information and it was significantly cheaper. Funny enough everyone in our car was from our hostel. We had a mother and son duo from France (Saliha and Dorian), a Brazilian (William), an English man (Rollo) and the two of us. So, in our car French, Portuguese, English and Spanish were constantly being spoken. The members of our group were all seriously awesome. We had struck gold, they always translated for us and were just genuinely nice people. The 4×4 we were in was a Lexus LX470. The car looked like it was in good shape and after our bags were strapped to the roof we found that the car was spacious enough for all of us. 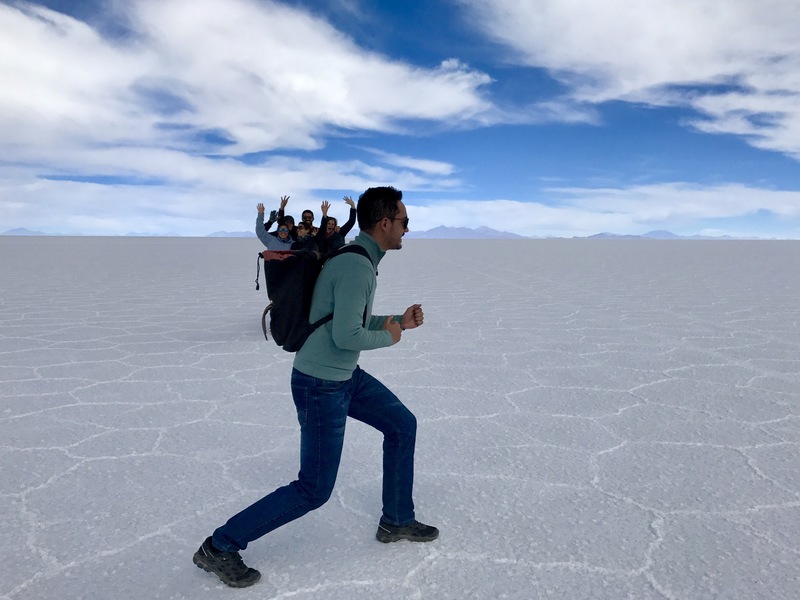 Our drivers name was Edwin, he was a middle aged Bolivian man who had been driving this route across the Atacama Desert and the Salar de Uyuni salt flats for nine years. The view after crossing into Bolivia via the Hito Cajon border. William, me and Courtney appreciating the fact that we were officially in Bolivia. 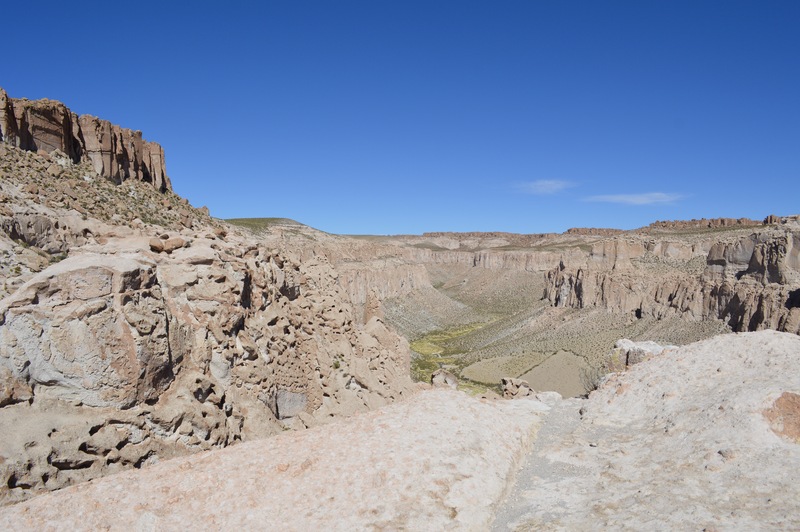 After crossing the border, we entered the Eduardo Abaroa Andean Fauna National Reserve. As we entered the reserve, the tar road stopped and we now only had dirt roads for the rest of our trip. 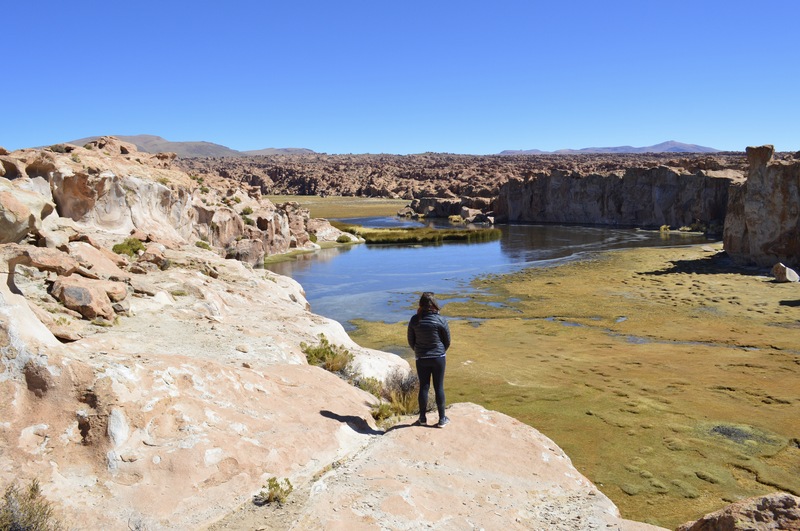 Our first stop in the reserve was at Laguna Blanca and Laguna Verde. These two lagoons were situated next to each other and were only separated by a narrow stretch of land. Laguna Blanca is a white salt lake (gets its color from being so mineral rich), which was completely frozen when we arrived. Laguna Verde, on the other hand, was a green lake. This lake got its color by being rich in arsenic. It had an inactive volcano behind it (Licancabur) and was a great stop due to it having hot springs next to it. These lagoons lay at an altitude of 4,300 m. The hot springs were a lot warmer than those at the El Tatio geysers. Saliha, Dorian, William and I braved the freezing weather and jumped into the springs. 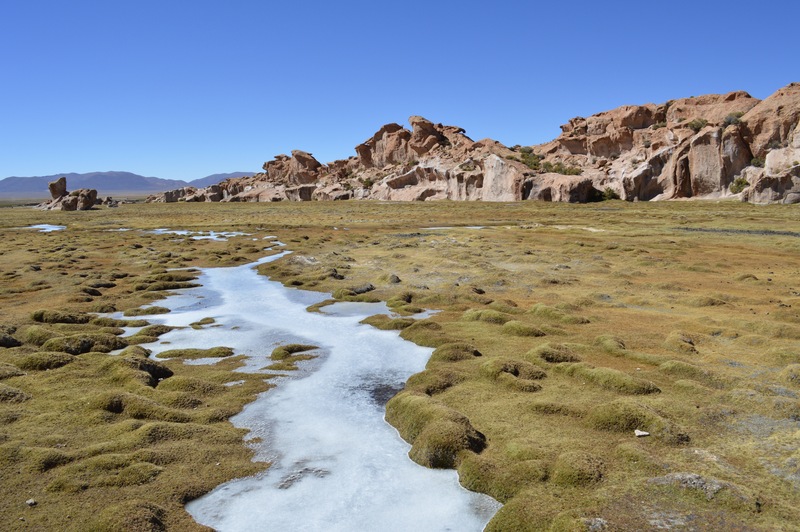 The water was warm, and from the springs we could see Laguna Blanca and vicuñas. Lunch was served in a hut close to the geysers. We were supplied with a salad (consisting of tomato, cucumber and goats cheese), boiled vegetables with chicken and sausage, mash potato and coke. The food was really tasty and provided us with the energy we needed for the rest of the afternoon. We jumped back into our 4×4 and continued onto a geyser. This geyser was impressive, and had a lot more steam compared to the geysers at El Tatio. The wind was howling and the smell of sulphur was strong so we didn’t spend much time here. While at the geyser, we had reached an altitude of 5,000 m. Unfortunately William, Dorian and Rollo had started to suffer from altitude sickness. Saliha had a slight headache, but Courts and I were absolutely fine- well expect from being extremely cold. Our next stop was Laguna Colorada. This was a pink lake that was home to hunderds of flamingos. 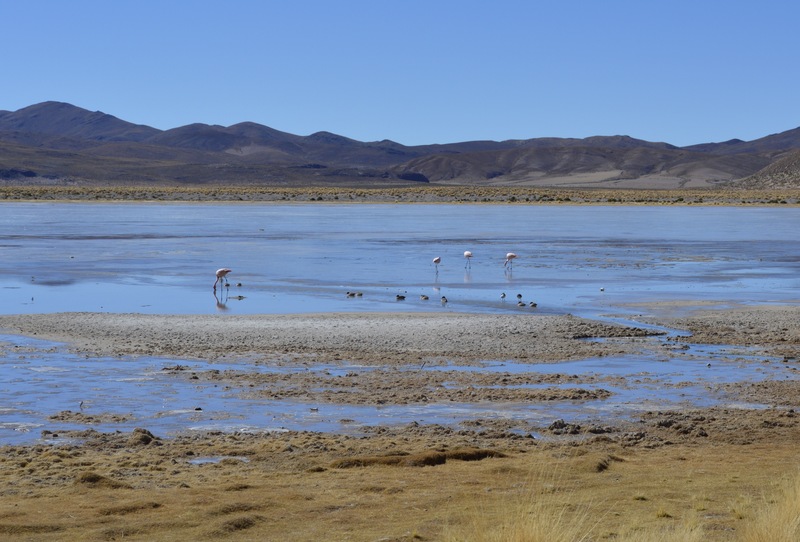 In the reserve, there were three types of flamingos: the Andean flamingo, the Chilean flamingo and the Jame’s flamingo. Unfortunately I wasn’t able to identify what type of flamingos these were, but nevertheless they were still beautiful to observe. 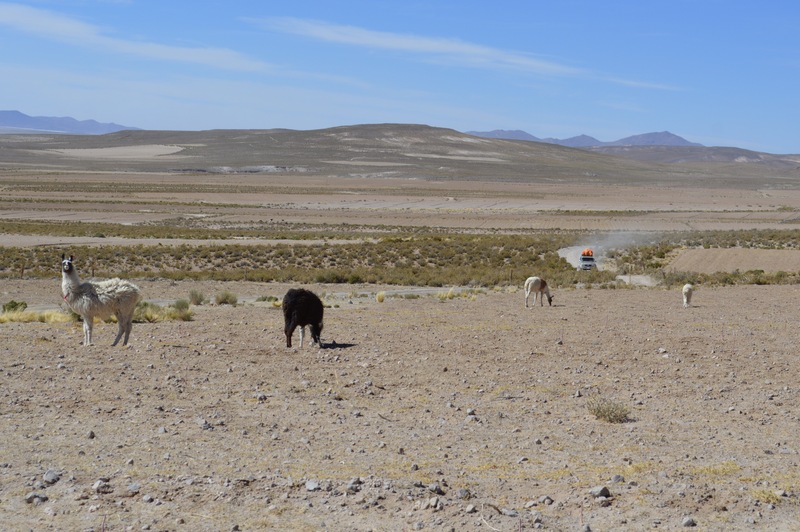 After Laguna Colorada we exited the reserve and saw our first llamas. Our whole car was really excited to see these animals. We continued to travel to the refuge, which we were to call home for the night. This was at an altitude of 3,800 m and had no showers. The beds were comftable and luckily we were all given extra sleeping bags to ensure that we didn’t get cold. When we arrived at the refuge William and Rollo went straight to bed, but Dorian seemed to be feeling a bit better in the lower altitude. We had vegetable soup, bread and spaghetti for dinner. We all had an early night so that we could be as fresh as possible for the next day. This accomodation was alright, my only major issue was that the bathroom was outside and it was FREEEEEEZING! The color of Laguna Verdes water was phenomenal. Enjoying the hot water while the air was below freezing. Vicuñas feeding near Laguna Blanca. The geyser at 5,000 m above sea level. Laguna Colorada, if you look closely- you can see the flamingos. The sunset from the refuge. We left the refuge at 8 am after having pancakes for breakfast. Everyone seemed to be feeling better, which was a huge relief. 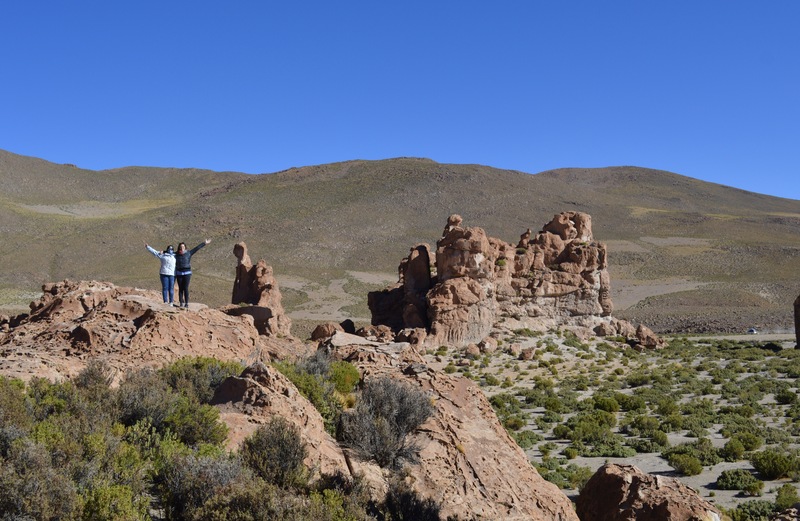 We travelled to Desierto Siloli to see the Arbol de Piedra (stone tree). This was a volcanic rock formation that looked like a tree. It was surrounded by other impressive rock formations. We spent time here taking photos before we left to go and see the formation know as camel rock. This rock formation was isolated from other rocks but was still something fun to look at. After leaving camel rock we drove to the saline lake, Laguna Hedionda. We saw flamingos on the ice in the middle of the lake and we saw llamas drinking from the water. After this we headed to our lunch spot, but first Edwin took us to Laguna Negra. This was a beautiful lake. We had to walk over small iced streams to get there, but the view of the lake was amazing! We had a potato with vegetable bake, rice, tuna, salad (avocado, corn, cucumber and tomato), nectarines and coke for lunch. After lunch we drove to a view point which over looked the canyon in which the Anaconda river lay. The wind was really strong here, but the view was worth it. Llamas were close to the road at this view point so we were able to get a better view of them and take some pictures. After the view point we drove for two and a half hours until we reached the Salt Hostel. Along the way, we passed many quinoa plants and an indigenous community (San Luan). This community had a small shop were we could try quinoa, cactus and coca beer. Dorian, William and I all bought a beer so that we could taste the different flavors. The beers had an interesting taste, but I thought they were all nice. Salt Hostel was a lot nicer than the previous nights accommodation. We could pay R20 (USD 1.5) for a hot shower and the rooms were warmer. We had vegetable soup, bread, chicken, rice, salad (tomato and cucumber) and Bolivian wine for dinner. This was a nice way to end the day, but again we went to bed early because we knew we had an early start the next day. Arbol de Piedra. It was fun climbing this rock for the the picture. 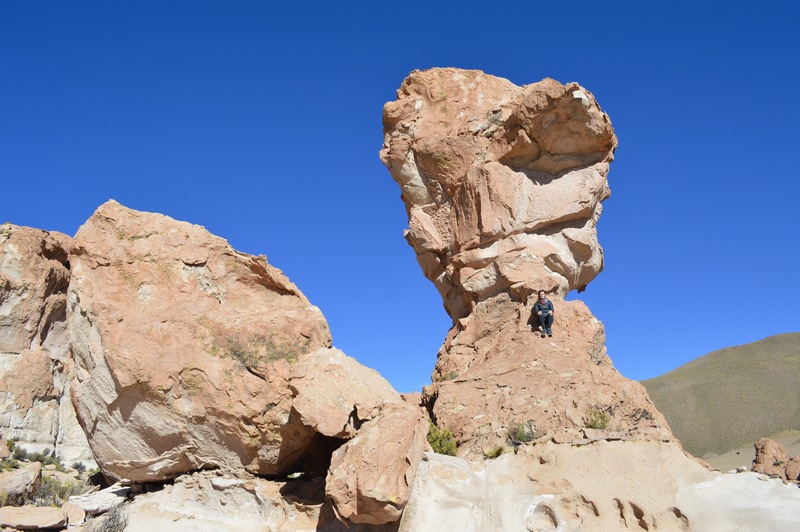 Appreciating the other rock formations around Arbol de Piedra. Camel rock, not as impressive as the stone tree… But still this was made by volcanic activity- how? Siting flamingos for the second time at Laguna Hedionda. Walking across frozen streams to teach Laguna Negra. Appreciating the view of Laguna Negra. Getting close and personal with the llamas. The view point that over looked the Anaconda river. 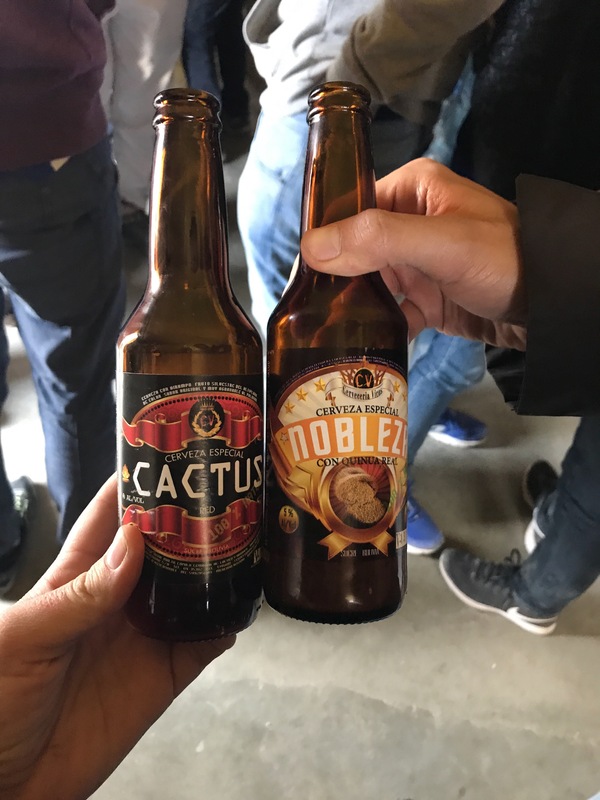 Cactus and quinoa beer. The cactus was a lot heavier than the quinoa beer, but both were delicious. The sunset from Salt Hostel. We left the accomodation at 5:45 am so that we could watch the sunrise over the salt flats. We arrived at a small hill that lay in the middle of the salt flats and tried to climb quickly to the top in order to catch the beginning of the sunrise. This was easier said than done, because at an altitude of 3,700 m it was hard to walk fast without losing your breath. The view at the top was breathtaking. We were on a hill that was covered in cacti and the salt looked like the ocean. The sunrise was beautiful, but it was cold so we walked back down after the sun had fully risen to a breakfast which included lemon cake, yogurt, cereal, hot chocolate and coffee. After breakfast we spent 4 hours on the salt flats. Salar de Uyuni is the worlds biggest salt flat. 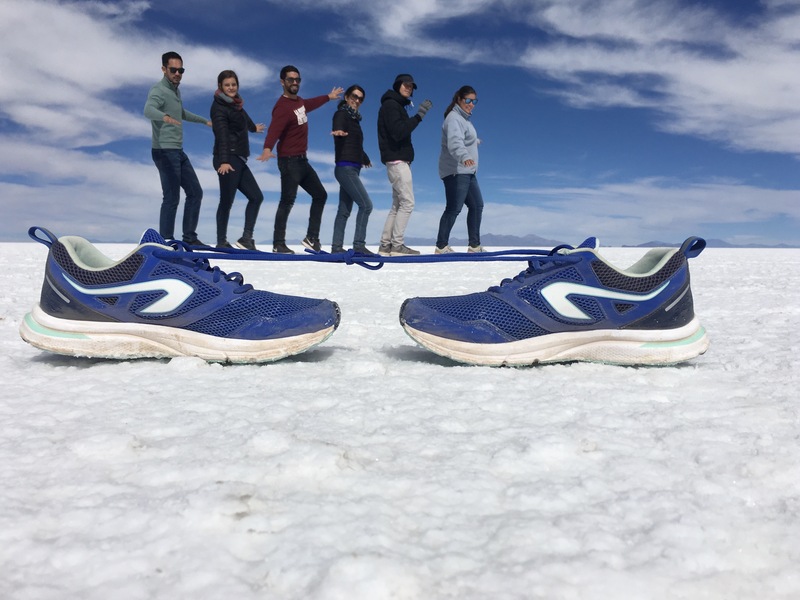 It is 10,000 square km and lies at an altitude of 3,650 m. This salt flat is home to approximately 60 % of the worlds lithium. We spent about an hour stopped in the middle of nowhere taking photos of this unique landscape. 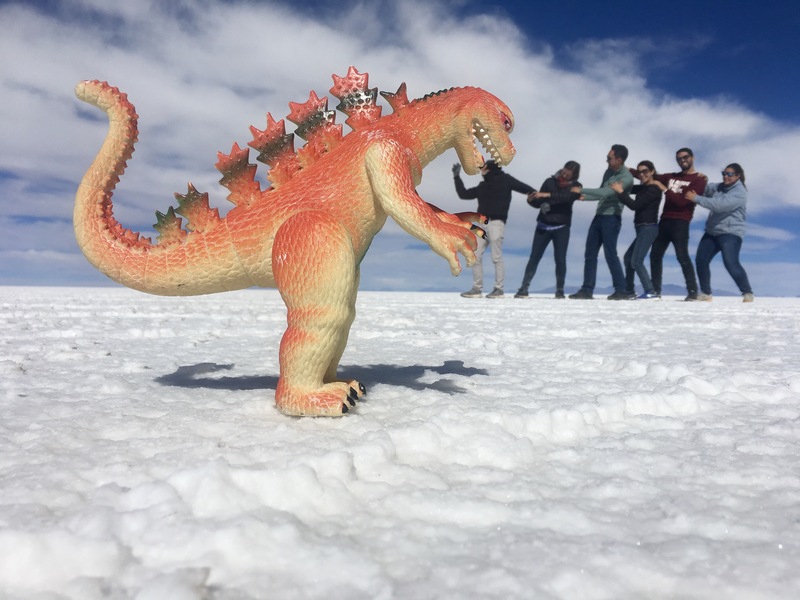 When we thought we were finished, Edwin pulled out his toy dinosaur and became the tour groups professional photographer. After exiting the salt flats we drove though a small indigenous village and stopped to buy souvenirs, then we briefly went to the train cemetery in Uyuni, and lastly we stopped in Uyuni for lunch. Lunch consisted of quinoa, boiled vegetables and llama. Surprisingly the llama meat tasted delicious. This proved to be the perfect way to end the tour. After lunch we all sadly went our separate ways. Sunrise from the hill in the middle of the salt flats. The colors at sunrise were beautiful and pastel. With the white of the salt and all the cacti it was an unforgettable experience. Arriving in the middle of no where in the salt flats to take pictures. 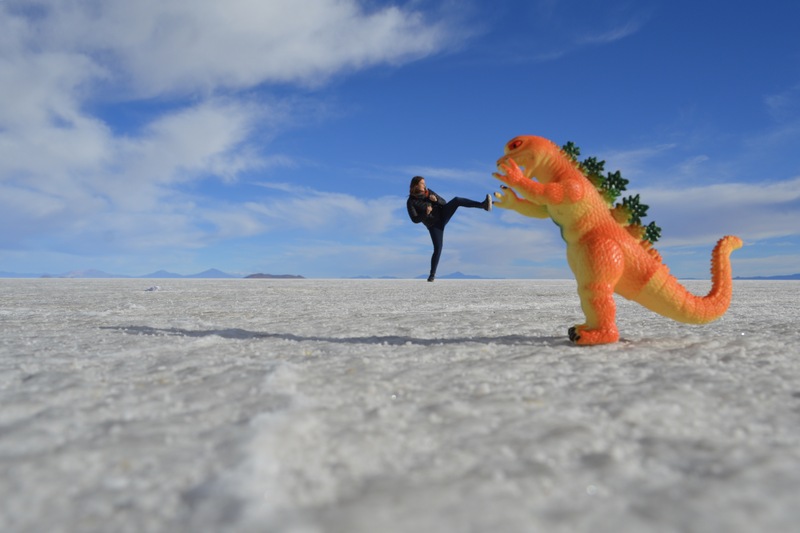 The cheesy pictures started, but who can resist fighting a dinosaur? Courts and I had to bring some of the Korean poses to the flats. Edwin became our professional photographer, and the ideas he had were hilarious! Trying to save Rollo from a vicious attack. The salt flats had a beautiful cracked pattern due to it being so dry. The dream team from the left: Me, Saliha, William, Dorian, Rollo, Courtney and Edwin. The White Beach Hotel, now used as a small shop had flags outside of it. It was fun to spot the South African and Korean flag. 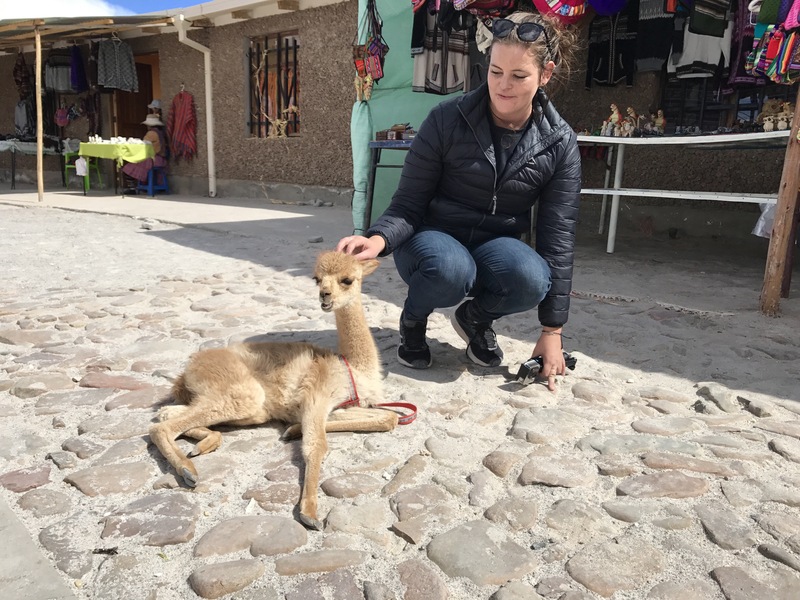 When we left the salt flats, we stopped at a small village to see a llama museum and to buy some souvenirs. I made a new best friend with this cute vicuña. This tour was great! I would recommend it to everyone, however there are some tips I would want to give anyone interested in this tour. First, definitely start in San Pedro de Atacama and end in Uyuni. Doing the tour this way ends with the main attraction and allows for the anticipation to grow. Make sure to look at online reviews for the tour company you want to go with. If you don’t have a company in mind, go with White and Green. Edwin drove at a maximum speed of 60 km/hr and was very responsible with our bags on the roof of the 4×4. We were really happy with this company! Courtney and I took altitude sickness medication (the main ingredient was acetazolamide) and we seemed to be the only ones not affected by the altitude. So, potentially consider buying some medication before you go. Book your tour only when you arrive in San Pedro de Atacama. We paid USD 150 for our tour, but it was advertised for USD 230 online. Make sure to acclimatize to the altitude in San Pedro de Atacama by spending a few days in this town. My final tip would be lower your expectations. Courtney and I went in thinking the accommodation would be very basic, the food would be simple and the 4×4 would be uncomfortable. Luckily all of this proved to be untrue. This led us to be continually satisfied and never disappointed. After a lot of time spent in the 4×4 with awesome people, spotting vicuñas and llamas and trying to take in all the scenery we passed, I can say that this was a truely unique experience!